As JMeter is a 100% Java application, so java needs to be installed with a JAVA_HOME environment variable. To check if java is installed, open the command prompt and type command java –version to check. 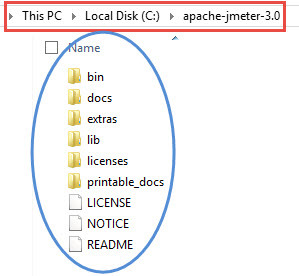 If Java is installed successfully, then please proceed else install java and then Just Download JMeter and install by unzipping the .zip or .tgz file in any location. For latest version of Apache JMeter 3.0 requires Java 7 or later version. Please check operating systems which are tested with JMeter on JMeter Wiki Page. There is basically no installation needed for the Jmeter, you don't execute or the set up file to install it. Download latest version of JMeter from the Official site which is always recommended. Once you download the zip, extract it locally in your system (you can keep this directory anywhere in your system). Ensure you install JAVA version which is compatible and the Java environment variable path correctly set. That's all Done, there is nothing more for you to do. You can rename the parent directory (i.e. apache-jmeter-X.Y) if you want, but do not change any of the sub-directory names. How to launch JMeter in GUI Mode? The first and easiest way to launch JMeter is by double-clicking on jmeter.bat (for Windows) or jmeter.sh (for UNIX) file. 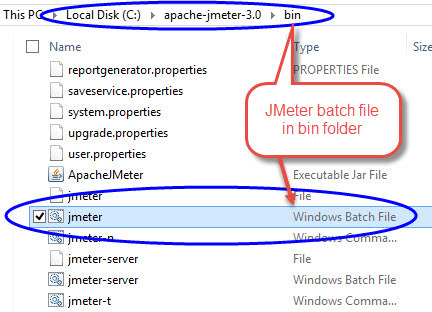 You can find these files in the Apache JMeter - > bin directory. Within a short time, the JMeter GUI should appear on the screen. If any error occurs then it may be cause of incompatible java version / issue in Java environment variable path, or JMeter file missing/corrupted. Try to solve these issue before moving forward. Make sure you run the jmeter.bat file as administrator, if not sometimes you may see error as 'java.util.prefs.WindowsPreferences WARNING: Could not open/create prefs root node Software\JavaSoft\Prefs at root 0x80000002. Windows RegCreateKeyEx(...) returned error code 5. Launching JMeter in GUI mode is perfect for adding, editing new configuration elements, thread groups and samplers as a result of which we can view a number of different listeners helping for debugging. On the other hand, it consumes more resources. GUI mode does have a limitation which slows down the CPU recourse utilization while running the script. If we are running multiple listeners in a script, it affects the performance of JMeter. Hence to overcome such a situation, to save resources, we should run JMeter in the non-GUI mode. How to launch JMeter in Non GUI/command line mode? -l: This specifies JMeter to log results. -j: Name of JMeter run log file (JMeter text logs) to log results. Apart from the above mentioned parameters, JMeter has many other parameters that can be used when running in the non-GUI mode. The below options are used for remote execution of JMeter tests and when using JMeter through a firewall/proxy server. 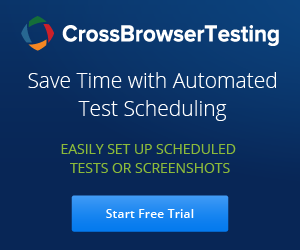 -r: Run the test in the servers specified by the JMeter property "remote_hosts"
Proxy Settings can also be defined in a Test Plan, using the HTTP Request Defaults configuration or bu using HTTP Request sampler elements.